In the previous model year, the two top-tier trims, Signature and Grand Touring Reserve, allowed customers to enjoy another level of sophistication with plenty of premium features for the midsize sedan. Likewise, customers were excited about the turbocharged SkyActiv-G 2.5T engine being added to the powertrain lineup. Following that success, for the first-time ever, the 2019 Mazda6 is now standard with the entire suite of i-Activsense safety and driver-assisting technologies. The Mazda6 Sport comes with an efficient SkyActiv-G 2.5 engine rated to deliver 187 hp and 186 lb-ft of torque. Cylinder-deactivation technology is standard on Mazda6’s 2.5-liter engine, which shuts off its two outside cylinders in cruising conditions for even more efficiency. A quick-shifting SkyActiv-Drive 6-speed automatic transmission is equipped on all Mazda6 models and includes a Sport Mode that recalibrates the gear ratios for more spirited driving. As mentioned, the i-Activsense safety features now standard in the Mazda6 Sport include Advanced Smart City Brake Support with Pedestrian Detection, Lane Departure Warning with Lane-Keep Assist, Smart Brake Support and Mazda Radar Cruise Control with stop and go function. This is in addition to other standard safety features such as Blind Spot Monitoring with Rear Cross-Traffic Alert, rearview camera and a new seat belt reminder indicator for all passengers. Automatic on/off headlights, High Beam Control, rain sensing windshield wipers join standard LED headlight with auto-leveling, LED taillights, 17-inch alloy wheels and dual exhaust outlets. Inside, occupants can enjoy the Mazda Connect infotainment system with eight-inch full color, touch screen display, six-speaker audio system, Bluetooth phone and audio pairing, two USB audio inputs, leather-wrapped steering wheel and shift knob, dual-zone climate control, push-button start, remote keyless entry and electronic parking brake, amongst other standard features. The Mazda6 Touring includes all of the convenience and safety features in the Mazda6 Sport, but upgrades to integrate Apple CarPlay and Android Auto capabilities, leatherette-trimmed seats, heated front seats, six-way power driver’s seat with manual lumbar support, Mazda Advanced Keyless Entry System power moonroof, 19-inch alloy wheels and two rear seat USB charging ports. Further heightening the premium experience, the Mazda6 Grand Touring boasts the aforementioned turbocharged SkyActiv-G 2.5T engine, which can generate a robust 310 lb-ft of torque from just 2,000 rpm and up to 250 hp with 93 octane gasoline (227 hp with 87 octane gasoline). The Mazda6 Grand Touring trim levels and above are upgrade with larger front ventilated brake discs; increasing to a diameter of 12.6-inch from to the outgoing model’s 11.7-inch. This trim level also adds a BOSE 11-speaker premium audio system, SiriusXM satellite radio with three-month trial subscription, auto-diming interior mirror and driver-side mirror, heated side mirrors and paddle shifters mounted on the steering wheel. Building upon the previous trim level, the Mazda6 Grand Touring Reserve incorporates many premium features typically found in luxury midsize sedans. These includes a windshield-projected, full-color Active Driving Display head-up unit with Traffic Sign Recognition, Adaptive Front-lighting system, black or Parchment leather-trimmed seats, ventilated front seats, heated rear seats, heated steering wheel, new automatic power folding side mirrors, eight-way power and memory driver’s seat with power lumbar support and six-way power passenger’s seat. The styling is also enhanced with a sophisticated, yet sporty bright silver finish 19-inch alloy wheels, LED signature lighting headlights and rear lip spoiler. Finally, the upper echelon for this midsize sedan is the Mazda6 Signature, an aspiration trim level brimming with premium amenities. One can’t help but notice the gunmetal front grille, that helps provide an aggressive appearance inviting all to step inside. The sophisticated interior is available in either Parchment or Deep Chestnut Nappa leather and adorned with authentic Japanese Sen wood and gilded UltraSuede interior accents. A 360º View Monitor with front and rear parking sensors, 7-inch TFT reconfigurable digital gauge display, Mazda navigation system and SiriusXM three-year Traffic and Travel Link subscription add to the convenient and safety features of the Mazda6. The black headliner, frameless rearview mirror, LED ambient lights and unique stitching on the leather-wrapped steering wheel complete the heightened look and feel. 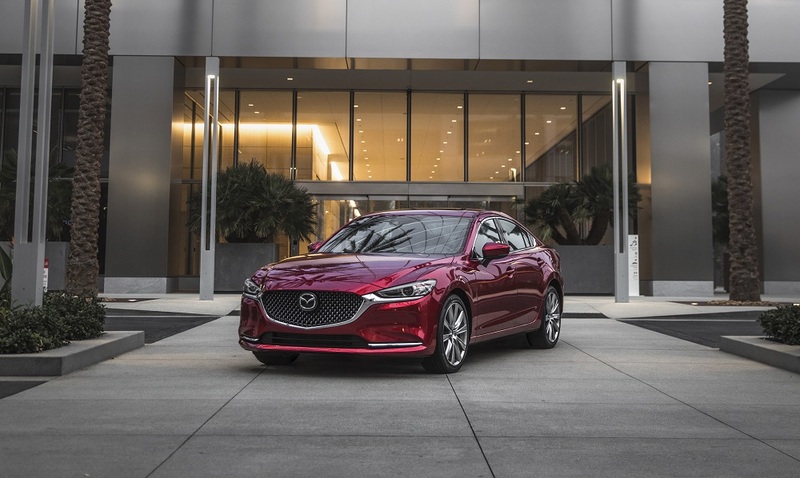 As Mazda continues to build a strong, emotional bond with its customers, it understands that there are still many fans of midsize sedans and is dedicated to providing refined, premium options. With its unique combination of driving character, safety technology and premium accommodations, the 2019 Mazda6, arriving in dealerships nationwide in April 2019 with priced from $23,800, continues to provide a compelling choice.